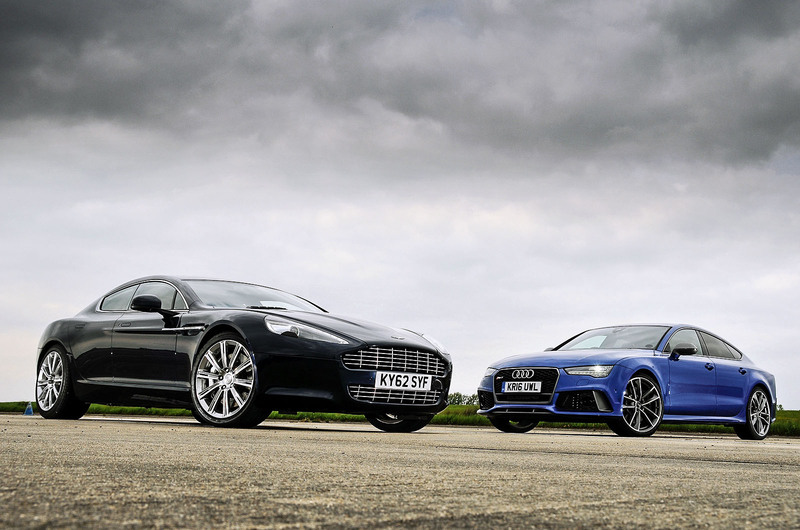 Can the V12 engine and timeless looks of a used Aston Martin Rapide tempt us away from a brand new Audi RS7? Twelve-cylinder Aston Martins can look too cheap, frankly, for the general pecuniary well-being of the British carbuying public. DB7 Vantages and DB9s priced at less than £40,000 look like fantastically tempting alternatives to modern sports cars at similar money – until you realise that they cost rather more than the typical modern sports car to keep. Rather more than the typical lottery winner’s pleasure cruiser one year out of four, I should think. Aston Martin main dealers charge around £1000 for a minor annual service on a 12-cylinder car and close to £4000 for a major 40,000-mile service. That, in a nutshell, is what a ‘Cologne’ V12 really costs. And that’s the expense you’re in for, assuming nothing else goes wrong. You can understand why so many buyer’s guides warn that if you can’t afford to buy one new, you probably can’t afford to run one second-hand. Thankfully, we’re not in such treacherous, misleading waters here. A ‘pre-loved’ Aston Martin V12 that costs around £70,000 is less likely to leave anyone in doubt that it’s an expensive car: to buy, to own, to juice up at the petrol station – full stop. And £70,000 will be about the size of the vacuum left in your bank account right now by a healthy early example of Gaydon’s extra-rare-groove four-door coupé, the Rapide. That’s cheap enough to be a much more realistic proposition than the car ever was at its original £140k-plus-options price, but still expensive enough to reflect its rarity and eccentricity. So let’s assume, for a while, that we’re all in the market for a deliciously powerful, genuinely usable, extra-desirable pseudosaloon, as well we all might aspire to be. Should you take a gamble on manageable running costs with a five-year-old Rapide, fairly safe in the knowledge that your car isn’t going to depreciate too much in the next few years? Or should you opt for the more expensive but more predictable ownership experience of a brand-new Audi RS7 Performance? Won’t ‘predictable’ just mean ‘prosaic’ in the Audi’s case – albeit perhaps only relatively so? Well, no, it won’t, actually. Not on the road, at any rate. And certainly not once you’re used to the incredible well of pace that the RS7 can tap into whenever you happen to fancy another neck workout. Anyone thinking that this might be a closely matched contest in terms of point-to-point pace has probably forgotten what a laid-back machine the original Rapide was. We’ll get to that. They’re definitely underestimating the sheer brutality of the Audi’s accelerative facets, though – which might allow it to sniff fiendishly at the tailpipes of plenty of supercars on most give-and-take roads and certainly to drive away from an Aston Martin that’s at a 30% disadvantage to the Audi on peak power and a greater one still on mid-range torque. The RS7 Performance is obscenely, almost schizophrenically fast. The car’s engine and accelerator pedal both feel quite tame and well mannered at first – fairly reserved, not highly strung at all and not even particularly imposing. Very Audi, really. Until you venture past the mid-point of the throttle, this is a luxury car of predictably polished capacities: easy to drive, light and pleasant in its control weights, nicely cosetting and quiet in the ride of its air suspension. Demure. And then, when your toe tips into that last inch of loud-pedal travel, the beast suddenly wakes up – and exorcises its sore head. So abrupt and dramatic is the increase in force you get from the car’s twin-turbo V8 that you couldn’t feed in the last 150 horsepower smoothly, even if you wanted to. The car simply bludgeons its way frantically towards the horizon, clawing venomously at the asphalt and yet somehow preserving most of the sense of luxury that it had before. So otherworldly is the Audi’s combination of incredible cabin isolation and all-dominating pace, in fact, that it seems an entirely unreasonable expectation of a 25,000-mile Aston Martin that has been lived in for four years to even approach it. The Rapide you see here is privately owned and was very kindly sourced for our purposes by the ever-helpful Justin Pearce of Aston Martin Works Sales and Service, Newport Pagnell (01908 610620, astonmartinworks.com). The car is used daily, as evidenced by the recent family christening invitation on the back seat, the umbrella and newspaper in the boot and an ashtray in the centre console full of loose change that rattled and chinked with every bump in the road. But even discounting the patina of use that people who love their cars inevitably leave on them, the Rapide has an impactful presence, desirability and motive charm that the RS7 never really approaches. Objectively, the Audi isn’t just the faster car here. It’s the more comfortable, more practical, better-riding, better-equipped and generally more accomplished vehicle, too. 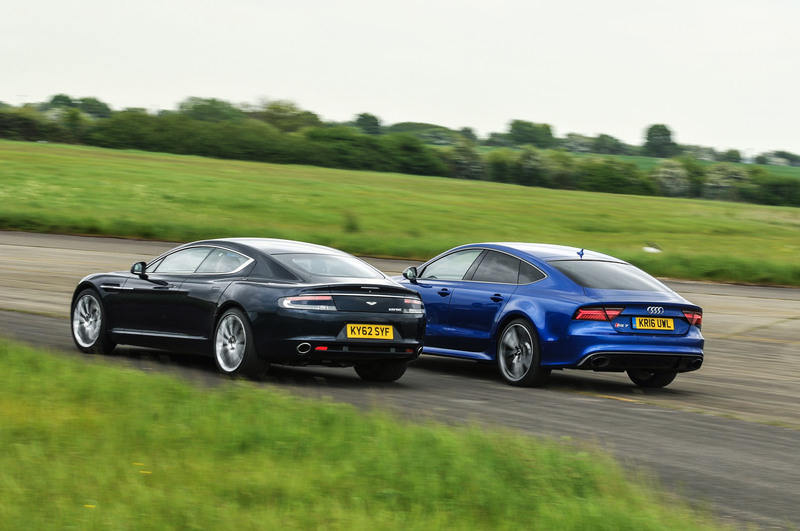 But where the RS7’s ability to get under your skin and earn a place in your lasting affections abruptly ends, the Rapide’s opens for business. I shall never tire of the noise that Aston’s long-lived V12 trills forth on start-up and I am confident that most of my neighbours won’t, either. There’s just something richer, thicker and fluffier about it than the sound of almost any other engine I can think of. This is what Jersey full-cream milk ought to sound like as it descends onto your morning Weetabix, if only it could sound like anything much. Inside the Rapide, at town speeds, the car’s 20in wheels and lowprofile tyres fuss a bit over sharper ridges and pockmarks and send the odd thump and eddy through the body structure. But the steering is wonderful: heavy but perfectly weighted, honest to a fault and big on contact patch feel. So although the Aston’s front wheels don’t grip the road quite as hard as the Audi’s, your confidence to use every last drop of what’s available is actually greater. You don’t, however, drive the Rapide that hard as you’re getting to know the car – not even close. In stark contrast to the RS7’s V8, the brilliance of the Aston’s powertrain is delivered right at the top of the accelerator pedal. Very few engines and gearboxes feel better matched and more smooth on the uptake than the Rapide’s 5.9-litre V12 and sixspeed ZF automatic gearbox. And so you ease this car into motion like an Olympic curling champion pushing off with his very last stone. So laidback is the gearbox that it’ll shift up before you’ve reached 2500rpm when left to its own devices in ‘D’. The Rapide’s totally relaxing richness is as unexpected as it is intoxicating. You’re only ever a couple of tugs on the gearbox’s left-hand paddle from discovering a much more enlivening side of the Aston’s character, of course. Between 3500rpm and 6000rpm, the Rapide commands a swift sporting pace that may not be as crushing as the Audi’s but is all the more likeable for its effusive sound and smoothness. The car corners keenly, with better balance and more tactile communication than the RS7 – and with the apparent bit of vertical heave over bumps of a set of slightly worn dampers, too, but nothing pronounced enough to be discouraging. I liked the Rapide before this exercise, albeit partly because five years ago I drove Aston’s press car much harder than I did this privately owned one and discovered how lazily it’ll take up drift angle. Childish, I know. But I like it all the more now I know how well it ages, and how rare and special it feels, even by Aston’s own standards. Could I sit in the back of one? Not for very long – but my kids certainly could, and I’d value very much the extra usability of that hatchback rear end and big boot. Would I take one over an RS7 Performance? In a heartbeat – and I’d use it every day. Could I afford the servicing? Not on your nelly – but instead of £40k of depreciation, perhaps it doesn’t look so expensive after all. Good choice! Infotainment used to be the sticking point with Astons for me, but phones are so good for music and navigation nowadays that all you really need is Bluetooth and a handy fastening point. It's certainly an infinitely more desirable car in most other respects. 2000 quid a year for servicing? That's if you do 20,000 miles a year and do a major service once every two years. Not quite supercar territory but a fair bit more than servicing for a £70k new car. How much does servicing for the RS7 cost? As for the using a phone or tablet for nav and audio, that's probably the best way to future-proof these older cars unless you're willing to install a third party screen. An iPad Mini might not look very elegant perched on a Rapide dashboard but it's a lot better than most in-car systems. You can buy a knackered old DB7 for £20k. Whilst you can buy a really knackered old A6, for 30 pence. We might have found a full size saloon with less rear headroom than the Tesla Model S. It certainly isn't the A7 with 37.2 inches. Anyone got stats on the Rapid? If its less than 35.3 inches we have a winner! Well some stuff is too stupid to let go... another one is claiming to be an enthusiast yet defending Vauxhall. You'd have to be on something for that to make sense. I suppose breathing in hair treatment fumes at a salon all day would also make suffice. Running either only really makes sense, if they can be run as a company car, as spending 70k on a car, and then spending the same amount, over three years, running it, would be difficult to justify, unless one has very deep pockets. 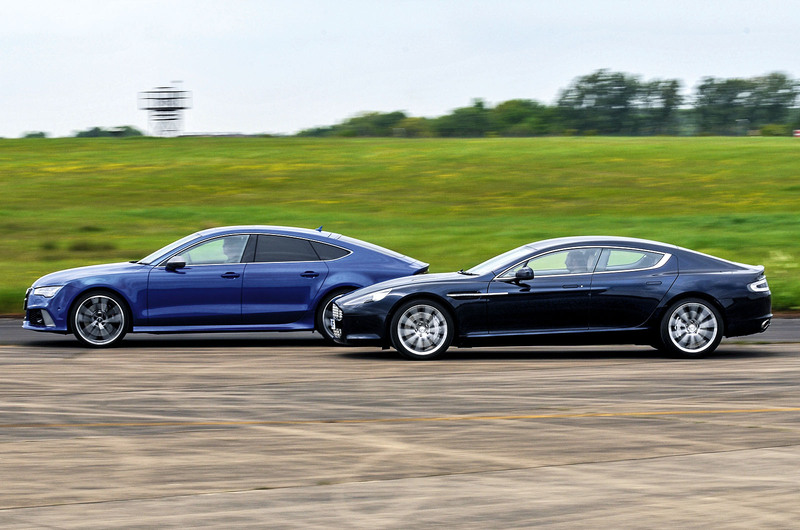 I know why Autocar have compared the Aston to the Audi (because it makes for a better article) but surely a more likely and real world pairing would have been a used Panamera Turbo vs RS7.